Yoshi and I are off to 1up the night! As you can see from my iphone cover, I love old school Nintendo, and so I decided I wanted to make Mario costume this year. I like a challenge, though, and I was hoping to also try an illusion costume this year. 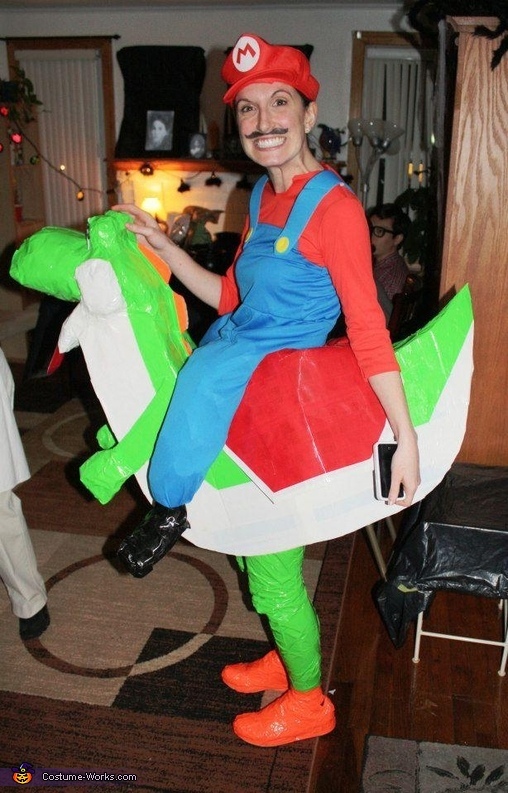 Solution: Mario Riding Yoshi! To make Yoshi, I bought 4 rolls of green duct tape, 2 rolls of white duct tape, and one roll each of red and orange duct tape. I also dragged out a large box I had lying around. For the head, I rolled up newspapers into balls of varying sizes/shapes (based on a photo of Yoshi I found online) and taped them with the appropriate colors before taping them to each other. I then topped two solo cups with more newspaper and taped those to the rest of the head, and pasted on some eyes I drew on computer paper. I used the duct tape to cover up any remaining gaps. To make Yoshi's body, I cut out two pieces of cardboard from am old box in a Yoshi profile shape, making sure the neck was wide enough to support the base of the head I'd made. I taped the two sides of the body together on the inside, with thick strips of cardboard to hold them apart wide enough for my hips to squeeze in. I then weighted the back down with a lot of rolled up cardboard inside the tail, in order to balance out the weight of the head. I then taped the head to the neck, using white and green tape to continue the color stripes down onto his body. I covered the gaps in the front and back with duct tape and backed them with newspaper so they wouldn't stick to themselves. I then continued the tape pattern across the rest of the body - only filling in the top a little bit, since I'd need room to get in. For the Mario half, I bought a child's costume (needed those short little legs!) and cut a slit in the back side of the crotch. I then stuffed the legs with newspaper and sealed them shut with more duct tape. I made shoes out of black duct tape that I had in the house and, of course, more newspaper. I taped the shoes to the bottoms of the legs. All in all, this was a super cheap costume (duct tape FTW). The duct tape was about $3/roll from Home Depot, the newspapers were free from my local transit station, and the Mario costume was $12 on sale at a drug store. So the whole thing was about $36 total and took around 12 hours to make!